Beim VX-C handelt es sich um eine perfekte Kopie des klassischen VOX Treble & Bass Booster aus den 60ern. Seine Klangschaltung und die Höhe der Vorverstärkung entsprechen genau dem Original, gekennzeichnet durch relativ geringes Gain und die hohle Mitten-Konturierung eines halb offenen Wah-Wahs, so gehört bei Michael Schenker und vielen anderen. Das Tone-Poti erlaubt eine Vielzahl von Soundeinstellungen. 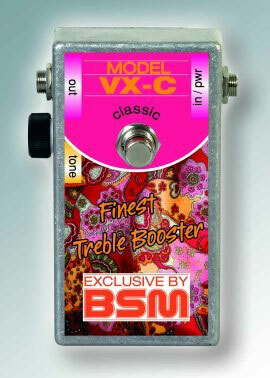 The BSM VX-C Classic model is the most authentical copy of the british Vox Treble & Bass booster from the late 60's, used by many british bands at this time. It offers the original tone network and gain from the original, to make it the perfect copy of this out-of-production stompbox. The VX-C Classic model includes a tone control, that allows an extraordinary amount of versatility from a wooly bass tone up to a sparkling high-end vintage sound. 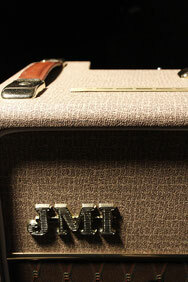 It´s also possible to produce the sound of a Wah-Wah pedal, set to a fixed middle position. So you can create the sound of Michael Schenker during his work with UFO or Mick Ronson, a famous guitarist in the early 70s backing band called SPIDERS of David Bowie. In comparison to it´s "hot brother", the VX-T, the VX-C Classic offers less gain and a more old-style tone control, while the VX-T is more focussed to pronounce the mid frequencies. Another sibling of the BSM VX family is the RMG, the custom model for the typical "jingle jangle" Roger McGuinn sound of the 60´s, the perfect booster for all clean sounds.